A new transit station that will help passengers quickly reach LAX terminals and a project to allow more frequent Red/Purple Line subway service were awarded a combined $109 million in state cap-and-trade funds, the California State Transportation Agency announced earlier this week. •The Red/Purple Line Core Capacity Improvements Project will receive $69.2 million in cap-and-trade funds. A newly widened portal southeast of Union Station and new tracks and switches will allow trains to turn around more quickly at Union Station so that subway trains could potentially run every four minutes on each line (and every two minutes between Union Station and Wilshire/Vermont, where the lines split) at peak hours compared to 10 minutes currently. The project will also reduce waiting times for riders and greatly expand the capacity of the subway, which is being extended to the Miracle Mile, Beverly Hills, Century City and Westwood. As many subway riders know, many Red/Purple Line trains now switch tracks before entering Union Station — the reason that some trains crawl in and out of the station. In plain English, this project allows that switching to take place after riders get on or off trains. •The Airport Metro Connector transit station will receive $40 million in cap-and-trade funds. Riders on Metro’s Crenshaw/LAX Line and Green Line will use the station — to be located at Aviation Boulevard and 96th Street — to transfer to the Automatic People Mover that will serve the LAX terminals. The people mover will be built operated by Los Angeles World Airports. The Connector station is being designed to include a full transit building, pedestrian plaza and bicycle facilities. The goal is to complete both the people mover and connector station in time for a potential 2024 Summer Olympics. The state’s cap-and-trade system sells permits to businesses that emit greenhouse gases (which are responsible for climate change). Funds from the cap-and-trade system are used to help pay for projects that reduce greenhouse gas emissions, promote transportation options and improve the state economy. This round of funding distributed $390 million for 14 projects around the state. Want to reduce your own greenhouse gas output? Generally speaking, taking transit instead of driving alone is one easy way to help Mama Earth. Go Metro and meet decathlon Gold Medalist Bryan Clay at APU/Citrus Station today! what would be the effect of this on the proposals for an Arts District Station or two in the maintenance yard? 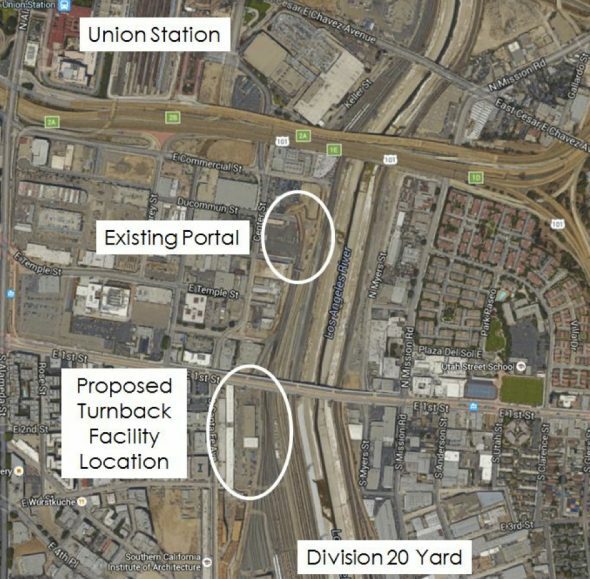 They’re going to build the turnback facility in such a way that would not preclude a station from being there. Steve – Why does Metro (and your posting) say that the 96th St / Aviation Station will serve “riders on Metro’s Crenshaw/LAX Line AND Green Line ? The Green Line turns east at Imperial Highway, well before the 96th St / Aviation Station. Is the Green Line being re-routed to go further north? Or is this just a shorthand way of saying that riders who ordinarily would take the Green Line now will be able to access the Crenshaw / LAX Line at the El Segundo and Redondo Beach stations ? Metro has been very circumspect about the southern terminus of the Crenshaw / LAX line. Will all cars on the Crenshaw / LAX line serve the five Green Line stations in El Segundo and Redondo Beach? Or will some trains turn east and serve the Aviation / Imperial Highway station instead? I wish that Metro could be more forthcoming about its plans for passengers in El Segundo, Manhattan Beach, Hermosa Beach and Redondo Beach who rely on the Marine Ave., Douglas, El Segundo and Mariposa stations as portals for entry onto Metro. What kind of service will we have to access the 96th St. / LAX station and to get to the Expo / Crenshaw station for transferring to the Expo line? Thanks for any insight you can shed on this. So, without platform improvements west of Aviation this means that some Crenshaw/LAX line trains will be limited to two cars – not good. Perhaps this will be ‘good enough’ for the public transit phobic beach cities. 1) What is the latest on the potential Arts District red line stops? Does this funding change the prospects of that happening? 2) The CalSTA release shows the total project costs for the airport station as $200mm. This grant brings in $40mm for the project, and the upcoming ballot measure would give it another $347mm, bringing the total funding to $407mm. Any idea what Metro would do with the extra money if the ballot measure passes? No real news on a potential Arts District station but this project is being built not to preclude that from happening — and, as I understand it, having a wider portal and more tracks would make it easier for it to happen in the future. As for the Connector, the idea is to put different funding sources together. Keep in mind that this project is still in the environmental study phase and design hasn’t been completed. There are a lot of different amenities that they want to add, so having as much funding would help determine what actually gets built. It’s probably way, way, way too early to declare a surplus! I wonder if, once they build the new turnback tracks, they can decrease headways past 8:00 from the currently embarrassing 20 minutes. I’m not holding my breath. The Orange Line initially started having headway’s 4-5 minutes apart during peak hours to accommodate the greater volume of passengers exiting each North Hollywood subway station train than the current interior layout of a Metro 60-foot bus could handle. A second bus was added for that overflow of passengers. When the Red Line starts running every 4-5 minutes during peak hours to the North Hollywood station, the Orange Line would require 80-foot buses to enable all the passengers from each subway train to get on the first Orange Line bus. Longer Orange Line buses would also potentially get more passengers on each peak hour subway train at the North Hollywood station. Less wait time at the subway stations during peak hours would shorten the average door-to-door trip time for passengers. This would make using the subway faster and more convenient than it currently is. You’ll know that if you miss one subway train that another one will arrive within 4-5 minutes. Earlier, I would have been all “woo hoo” about the LAUS improvements. But now, with “20-minute Phil” at the helm, I have no confidence the extra capacity will be broadly used. Is there a timeline or overview for the turnback project? I don’t think I’ve seen it before this funding announcement? I’m trying to get the exact timeline but I think it’s safe to say early to mid 2020s. I know they see this as integral part of the Purple Line Extension project. Really hoping for an arts district station around 4th or 6th street. How much would a station there cost in addition to the grant for the widened portal? Does this provide funding for the SCRIP project? This is for the turnback facility. SCRIP is a different project – it would extend the Metrolink and Amtrak tracks across the 101 to a junction with the tracks on the west bank of the L.A. River.